Pet fox Archer dies of laughter every time he hears a puny human laugh. 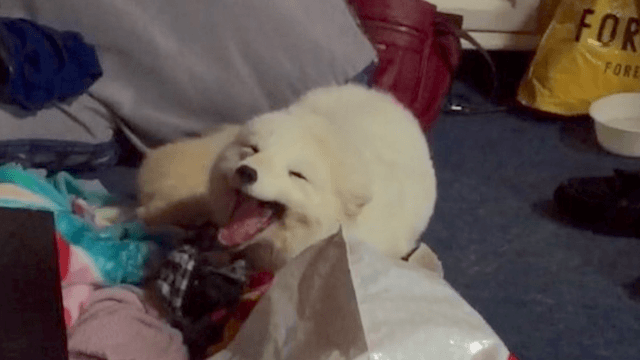 Instagrammer Kristina S. has a pet Arctic fox named Archer, which in and of itself is incredible because who knew it was okay to have pet foxes. Though there doesn't seem to be much of a bar for pet foxes since, you know, they're not ideal pets, Archer seems to be a pretty chill one. It's endearing how amused he is by human laughter. It slays him. "When my boyfriend laughs, Archer laughs," Kristina captioned the video. What's the fox thinking? "Hahaha, this human is amused by the mundanity of life. ROFL. He knows nothing. Hahaha." Archer obviously has something figured out that humans don't. Archer appears to have it together more than Kristina's husky, Luna, who is so pleased with how she can play with a piece of fabric. Please keep laughing at people, Archer. It's very weird and cute.